Austin Pierce looks for the River Cities four-peat this Friday night. 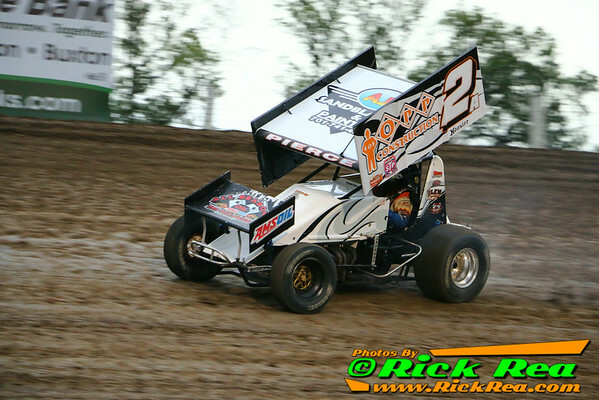 GRAND FORKS, ND (July 24) - The Northern Outlaw Sprint Association will be back at it again this weekend with racing at both River Cities Speedway and Buffalo River Race Park. The action kicks off Friday night at the high-banked 3/10th mile track in Grand Forks where NOSA Points leader, Austin Pierce, will try for his fourth consecutive win at the speedway. As usual, however, he'll have to top the always tough Mark Dobmeier, along with Chris Shirek and Casey Mack, just to name a few. On Saturday night, the series will head south to Glyndon, Minnesota where everybody is hoping the third time is the charm. The first scheduled visit for the NOSA Sprints was rained out back in late May, as was the make-up event in mid-June. Dave Glennon and Thomas Kennedy, last year's winners at BRRP, will look to park their machines in victory lane once again at the tight quarter-mile.